Fourteen students accused a long-time San Dieguito High School Academy math teacher of inappropriate touching, remarks and other behavior. The school district and teacher negotiated his resignation after Voice of San Diego requested documents related to the accusations. 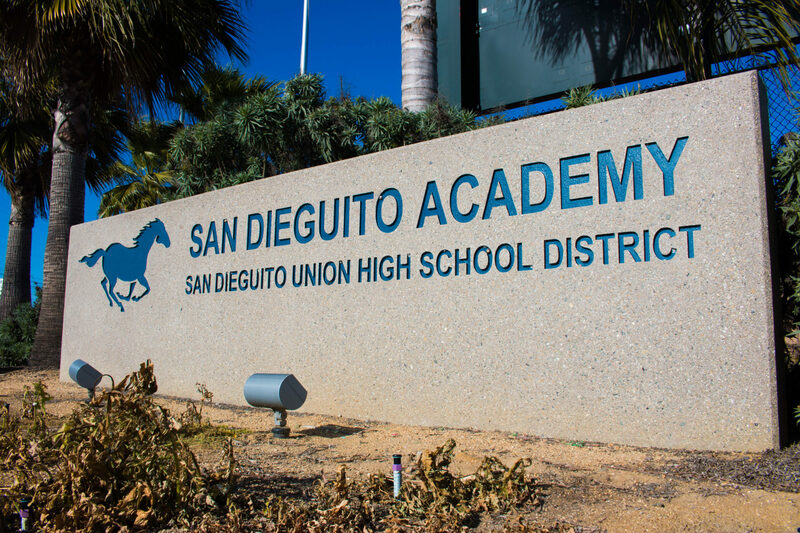 A long-time math teacher at San Dieguito Academy resigned after Voice of San Diego requested documents related to allegations against him by 14 students. / Photo by Adriana Heldiz. A longtime math teacher in the San Dieguito Union High School District who’s been on paid leave since Oct. 31 recently reached a deal to resign after being notified that student complaints alleging inappropriate behavior would be released to Voice of San Diego. Fourteen students complained to school officials about San Dieguito High School Academy math teacher Donn Boyd last May, according to investigation records obtained by Voice of San Diego through a California Public Records Act request. All student names were withheld. Several students said Boyd, 59, developed a pattern of touching female students in unsettling ways and made comments about their appearance. As a result, some asked to be assigned to a different class, while another said she hid from him in the hallways. One expressed fear confronting Boyd would lead to a bad grade. “Mr. Boyd came up to me at school, hugged me & kissed me on the forehead,” one student wrote in a witness statement. “He has hugged me often & put his arm around my neck, massaged my shoulders & it makes me extremely uncomfortable.” Records show the student also expressed concern about her younger sister taking Boyd’s class. The same student, a senior, said she was reluctant to complain about Boyd’s behavior, but ultimately felt it was important. Boyd, who struck a deal with the San Dieguito Union High School District to take eight months of paid leave and resign, declined to discuss the student claims. The settlement, signed by the district Jan. 19, ends Boyd’s 23-year career in the district on June 30, 2018. According to salary records obtained by Transparent California, compensation for Boyd’s leave will likely exceed $74,000, not including benefits like health insurance and pension contributions that he will continue to get through June barring certain events, like working for another public school district. Boyd’s California teaching credential — first obtained in 1988 — is still valid and he has no public record of discipline by the Commission on Teacher Credentialing. He is free to take another teaching job in California. It is not clear if Boyd remained in the classroom the last month of the 2016-17 school year and returned to work for the fall semester Aug. 29, before going on paid leave Oct. 31. District officials have not answered those questions, despite multiple requests. Paige was the principal at the time. Boyd also alleged the complaints originated with a disgruntled student caught cheating on a statistics test who also had her phone taken away by Boyd repeatedly, and claimed other complaints came from her friends. Click here to read the full rebuttal. “In this case many of the students who came forward with concerns about what they saw as inappropriate behavior from Mr. Boyd had been academically successful in Mr. Boyd’s classes,” Paige wrote in a response letter placed in Boyd’s personnel file May 22. In the May 10 reprimand, Paige also claimed Boyd had been reprimanded 10 years earlier for similar behavior. “This is not the first time you have been spoken to about this topic; on January 30, 2007 you received a letter from SDA administration about a student complaint about inappropriate touching and conversation with a student that made her feel very uncomfortable. At that time you were ordered to attend sexual harassment training,” Paige wrote. According to school district records, a stream of students lodged complaints with school officials last May. One complaint led to another, and another over a two-week period. Eight San Dieguito High School Academy students said Boyd massaged their shoulders, hugged or touched them in ways that made them uncomfortable, records show. Others said they witnessed Boyd touching other students, heard him make suggestive remarks and requests of female students. The school’s assistant principals at the time, Robert Caughey and Brieahna Weatherford, compiled incident reports recapping the student accounts, district records show. In one case, a mother told Caughey her daughter “did not feel comfortable with Mr. Boyd alone” and dropped his class. The first student to complain in 2017 initially took her concerns to her counselor, then told Weatherford about a shoulder massage from Boyd and provided names of other students to talk to. That student, who had Boyd for statistics, said she was bending over her friend’s desk one day when Boyd started touching her. Other students reported seeing the incident, including a student who also reported seeing Boyd touch another student’s “waist and side.” A different student told Weatherford Boyd once put his arms in her lap while helping her with homework as she was sitting cross legged on the floor. A senior student, who said she dropped out of Boyd’s class her junior year after receiving unwanted touching, wrote in a statement, “Mr. Boyd has picked me up & hugged me several times… In the halls he will grab the back of my neck & shake me. I’ve run away & hid behind people in order to avoid just talking with him.” On one occasion, she said Boyd picked her up, spun her around and told her he was excited to have her in his class. One student who complained about frequent touching from Boyd said he repeatedly tried to get her to share her club sports game schedule, so he could come watch her games. When she didn’t send it “because that is weird he kept asking me in class about it,” she wrote. On May 9, a junior wrote in a statement, “Mr. Boyd has done a few acts that could be considered creepy or perverted. In my class he would always wait for the same girl to come to class and have her erase the board. Even if she was late she would wait for her. As she would erase the board he would stare at her and watch her.” The same student reported Boyd singled out a girl with a short skirt for a special task. “He called her up to pick up a pencil that he had dropped. He staired (sic) at her while she picked it up and it was very uncomfortable for the whole class,” the student wrote. Boyd has been on paid administrative leave since Oct. 31, San Dieguito Union High School District officials said. A settlement to part ways was reached in January, two months after VOSD filed the public records request. Boyd was notified of the request by December. While on leave, Boyd has learned more about the uneasiness he caused some students. According to Boyd, many of the district’s investigation documents — including the actual student statements — were not shared with him until Voice of San Diego made a request for them. He had just seen the district’s summary and his own rebuttal. After seeing the student statements, Boyd addressed some of them in a three-page response provided to VOSD by the district. Click here to read the full response. Boyd explained his interest in a student’s club team schedule saying, as a soccer coach for the school, he takes an interest in all players. He said when the student was caught cheating, she broke down in tears and began to hug him. Boyd closed the response letter saying, “I want to acknowledge that I understand allegations of this nature are serious and must be thoroughly investigated. I admit that I have touched students, both male and female on discrete occasions exemplified above, throughout my career. Before working for San Dieguito Union High School District on Aug. 31, 1994, Boyd taught at schools in Pasadena and La Puente, Calif., according to his resume. San Dieguito Union High School District serves roughly 13,000 middle- and high-schoolers in Encinitas, Solana Beach, Del Mar, parts of San Diego, Carlsbad and other surrounding areas. School Let Teacher Accused of Inappropriate Touching Back in Class. Another Student Complained.